This is the longest of our holidays from Lyme Regis to Poole. Walking the whole route over 7 walking days is a great way to explore the area in more detail. The average daily mileage on this holiday is 12 miles and your longest day of walking is 15 miles. This holiday lets you enjoy the trail and local towns along the way in a more relaxed pace. There is a military firing range on almost the whole path between Lulworth and Kimmeridge. The range is most likely to be open at the weekend or on a public holiday. When the range is closed you will need to follow the inland alternative route. 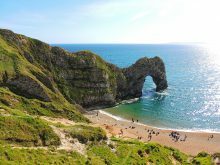 There is a diversion for cliff fall at the start of the path through the range -you can cross Lulworth Cove to re-join the path on the other side of the bay except at high tide when some road walking is required. The route is then along the cliff tops with steep climbs, rusting military machinery from target practice and Flowers Barrow, the site of both an iron-age hill fort and WWII gun emplacement. When the range is closed the alternative route passes through woodland and country estates. There is more wildlife around this path than along the coast, it is a scenic walk following a longer but less undulating route. The paths meet again at Kimmeridge Bay. After leaving Kimmeridge Bay you pass Clavell Tower, a distinctive folly built in the 1830’s and moved back from the cliff edge when it was in danger of falling into the sea. There is a long steep ascent up Houns Tout cliff, then more climbing for Emmett’s Hill and a steep section both down and up to reach St. Aldhelm’s Head where there is a small 12th century stone chapel. The route continues more gently up and down through fields and an old quarry. As you near Swanage you will pass Anvil Point lighthouse and Durlston Nature Reserve. The seaside town of Swanage has a long sandy bay and Victorian pier. It is also home to the Wellington Clock Tower, one of several monuments, large and small, moved here from London by George Burt, a former Swanage resident who moved to London in the 19thcentury but retained his interest in his birthplace. 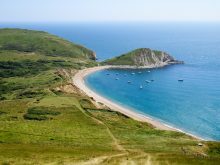 After a flat amble along the seafront at Swanage the path climbs over Studland Hill, your final climb before descending to Old Harry Rocks, and down again to Studland Bay and South Haven sands. The walk over the sands to South Haven point is flat but quite hard going for around 2.5 miles. The statue marking the end of the South West Coast Path is shortly before the ferry landing at South Haven Point. From South Haven Point you will use the ferry and/or bus to travel to Poole.